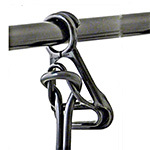 The cable hanger, also known as cable clamp, is an economical accessory frequently ommitted in installations. Its use is highly recommended to fix all cable-suspended devices (float level switches for example) in order to avoid any risk of cable deterioriation. Easy to mount, the cable hanger allows the fixation of the electrical cable at the desired height and its precise adjustment at any time.